This page assumes you have either built your server from my previous page here, or have sufficient knowledge to do so. 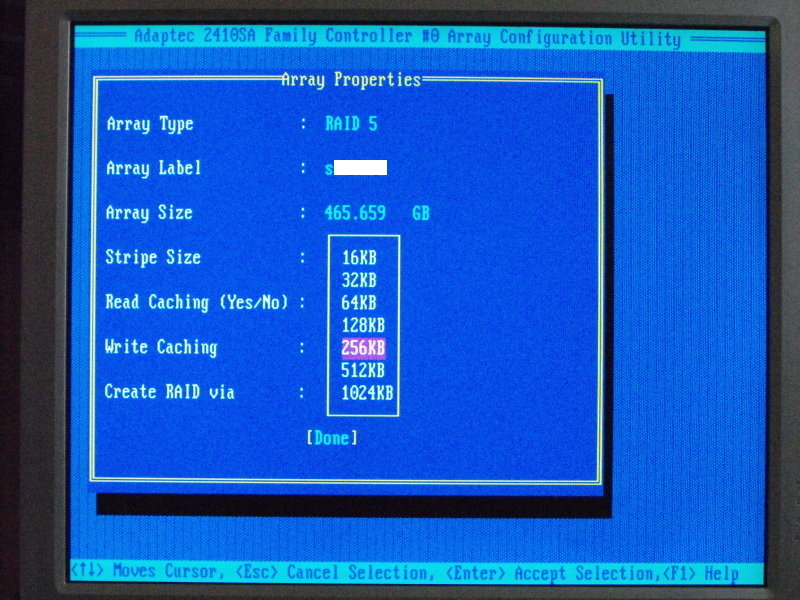 It also concentrates on why I chose RAID 5 and in particular, how RAID 5 is set-up on the Adaptec 2410SA card. 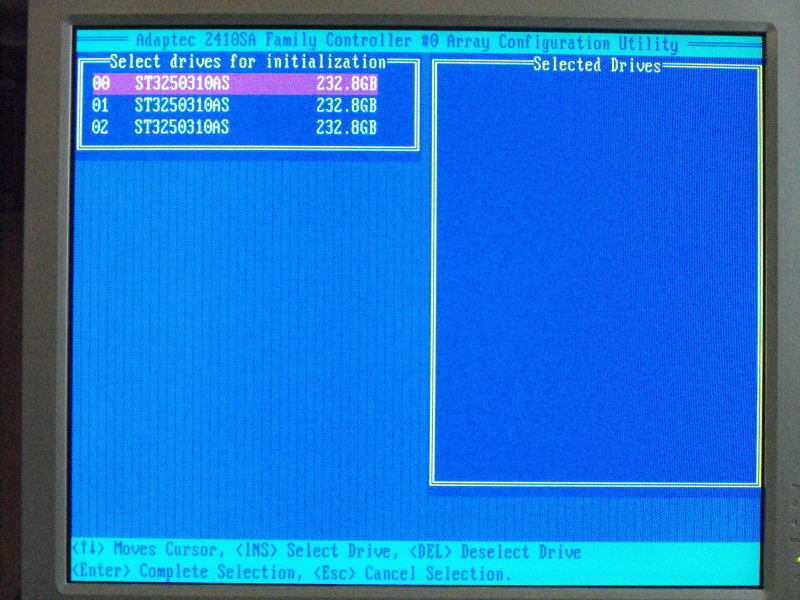 According to the Adaptec information, you should be able to place the CD in your drive and it will auto-boot to allow you to configure RAID. 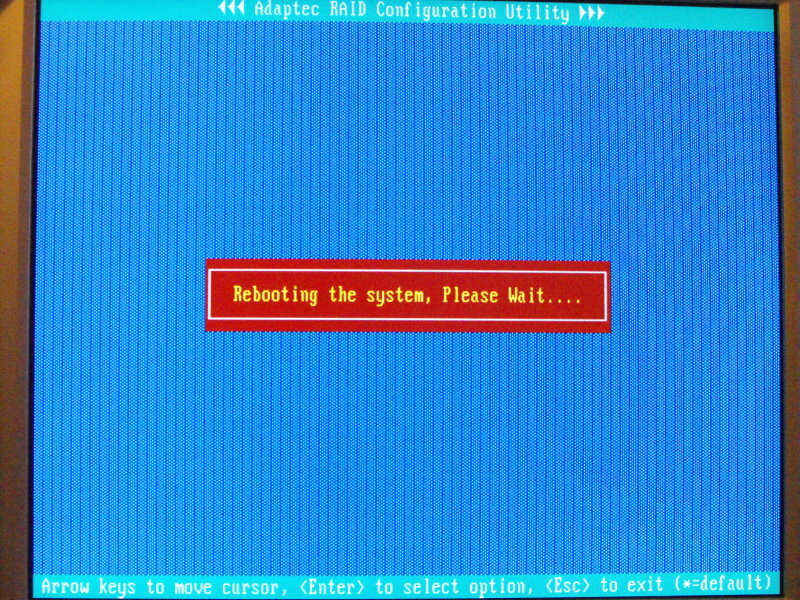 I tried several times and on every occasion, it failed to boot. 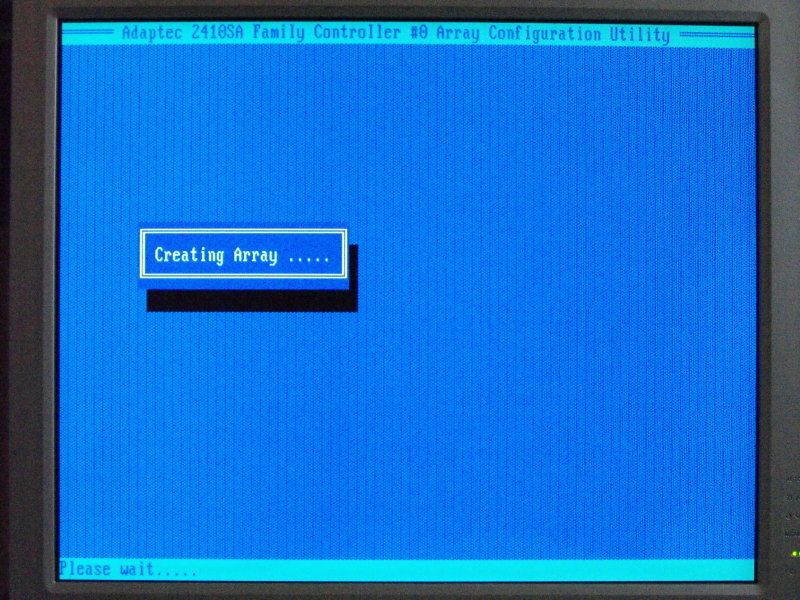 However, all is not lost, as the firmware on the card itself, will allow you to set-up the drives in the manner you wish. 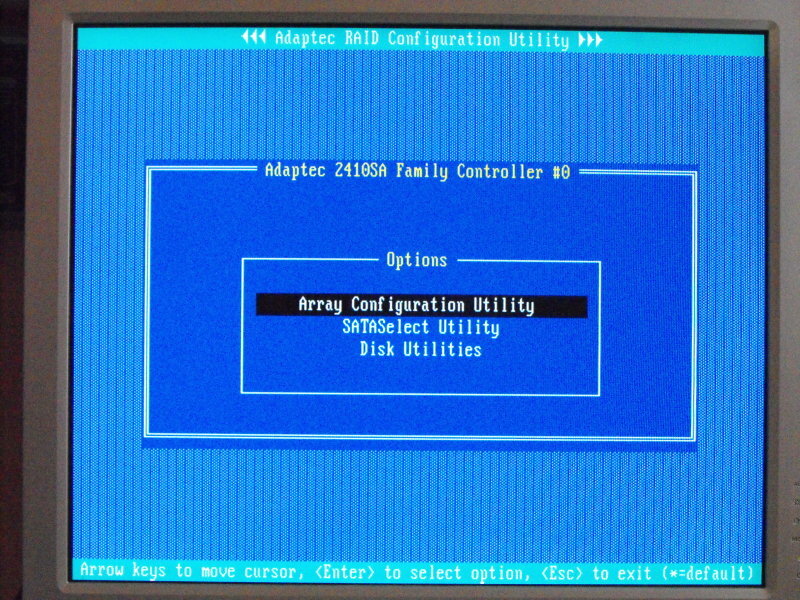 It is that configuration, I propose to discuss here, known as ARC (Adaptec RAID Configuration). Well, RAID 0 (striped drives) distributes data across two or more drives that gives improved speed and no lost capacity, but all data on all disks will be lost if any one disk fails. 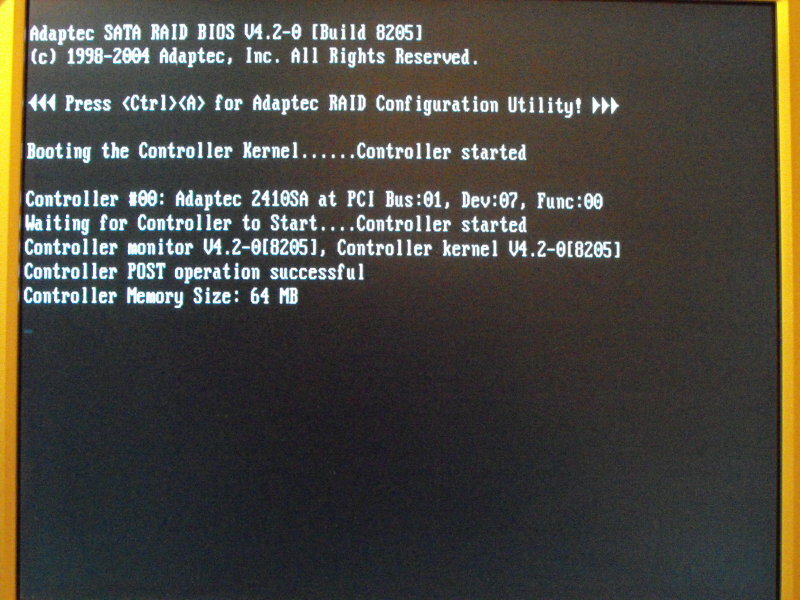 I needed data protection, so RAID 0 was no good. 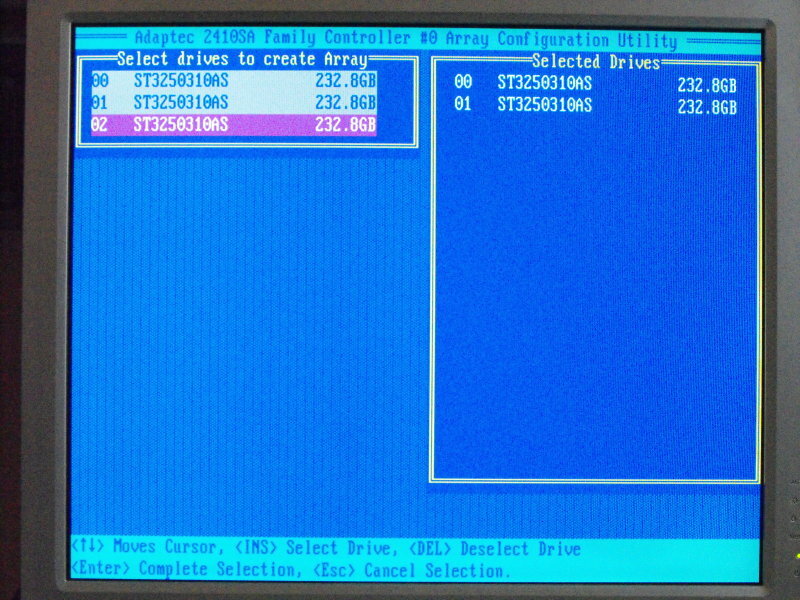 RAID 1 (mirrored drives) duplicates data across two or more drives, providing full redundancy. One could be forgiven for thinking that’s cracked it, but it doesn’t offer the possibility of an automatic rebuild, if a drive is lost. RAID 5 (striped drives with parity) is a combination of three or more disks in a way that protects data against loss of any one drive. So here we have (effectively) a combination of RAID 0 and RAID 1. 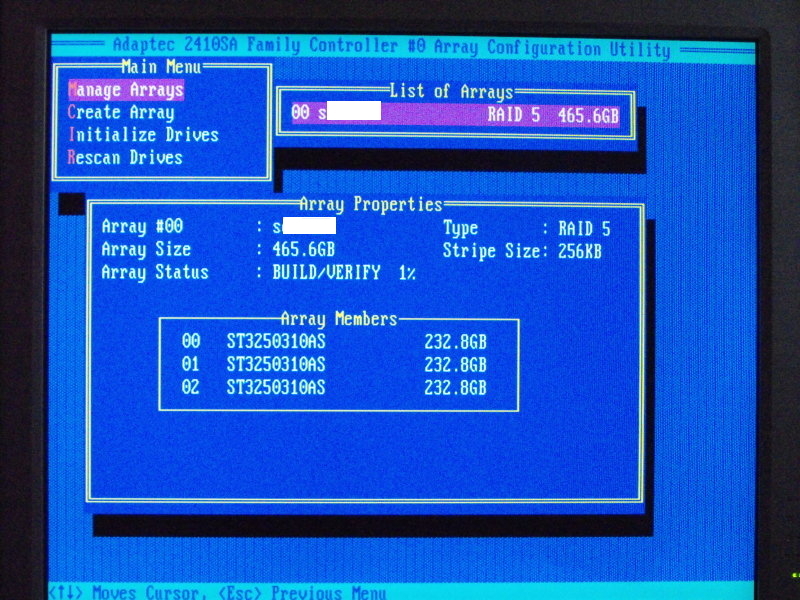 RAID 5 has a total capacity of all the drives minus one. 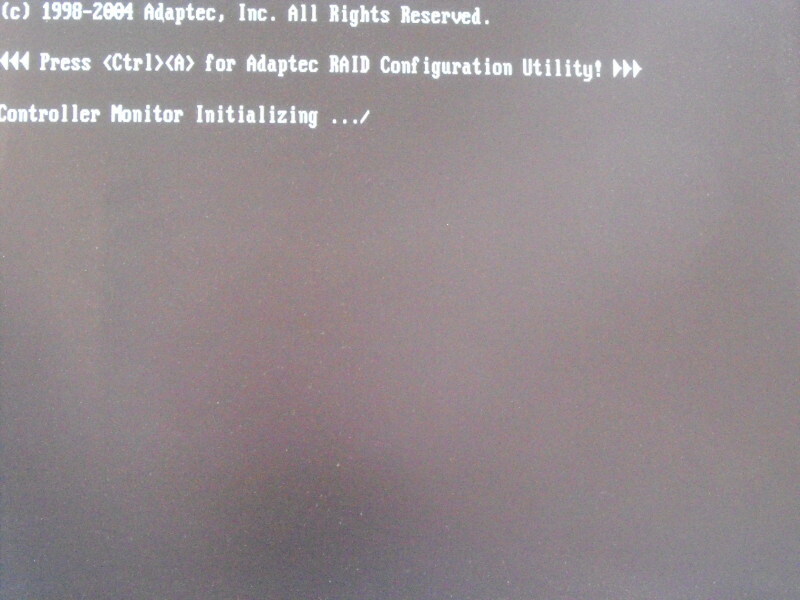 The way the Adaptec card is set-up, requires a minimum of three drives for RAID 5. It advises the best performance will be achieved by using identical drives. 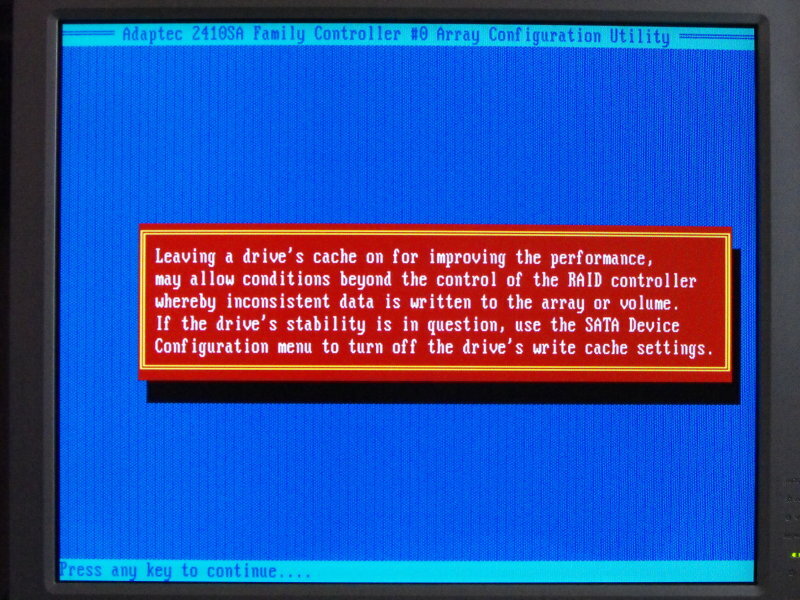 If you don’t, the performance and capacity will default to the slowest/smallest drive. 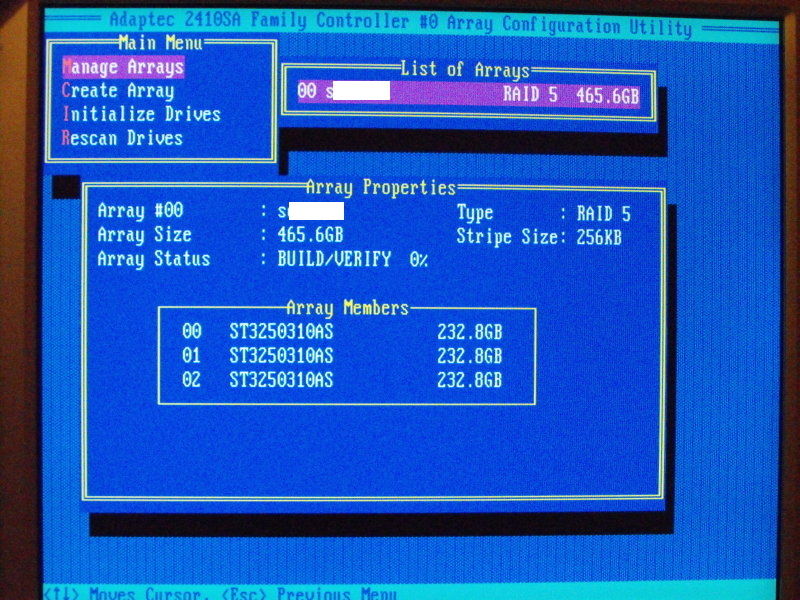 In my case, I started off with three 250GB drives, therefore, the total capacity of the RAID 5 configuration would be 500GB (750GB-250GB). 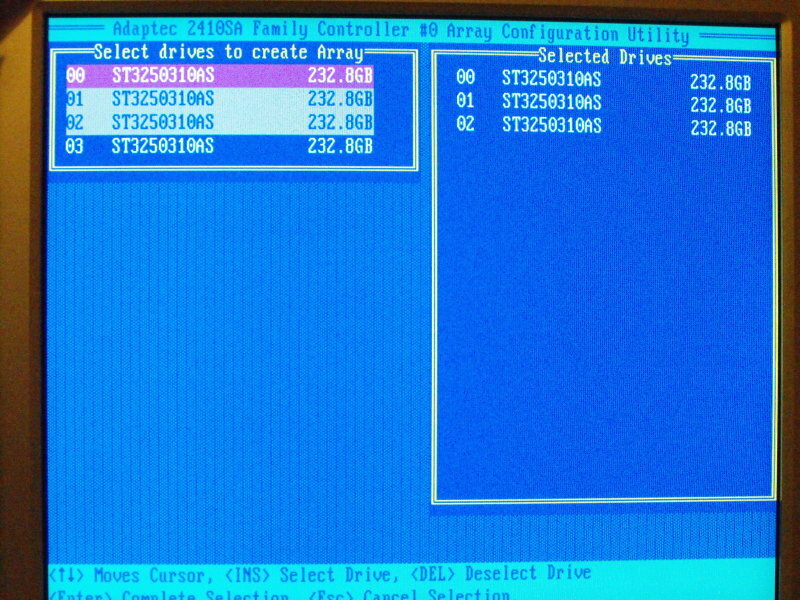 RAID 5 also allows for a data rebuild if you loose one of the drives. The Adaptec card allows for hot swapping, (the ability to replace a drive without turning the server off) but I have to admit, in a conventional case such as the one I used, you’d be hard pressed to carry it out without damaging something. Far safer to turn it off. Turn the computer on and if all is well, this is what you’ll see. 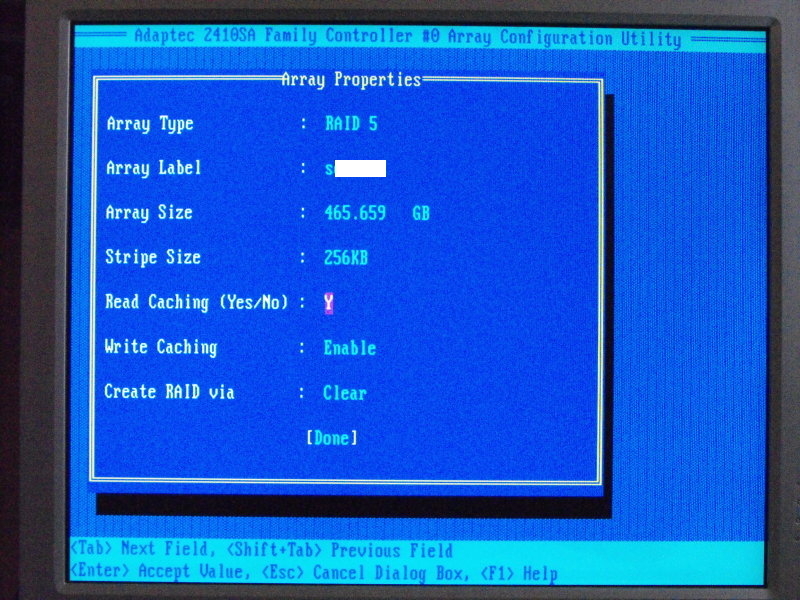 You can see you need to press Ctrl+A to access the ARC utility. Using the ”’Arrow”’ keys, you need to highlight each drive and hit the ”’Insert”’ key to move the drive from the left side of the screen, into the Selected drives area. 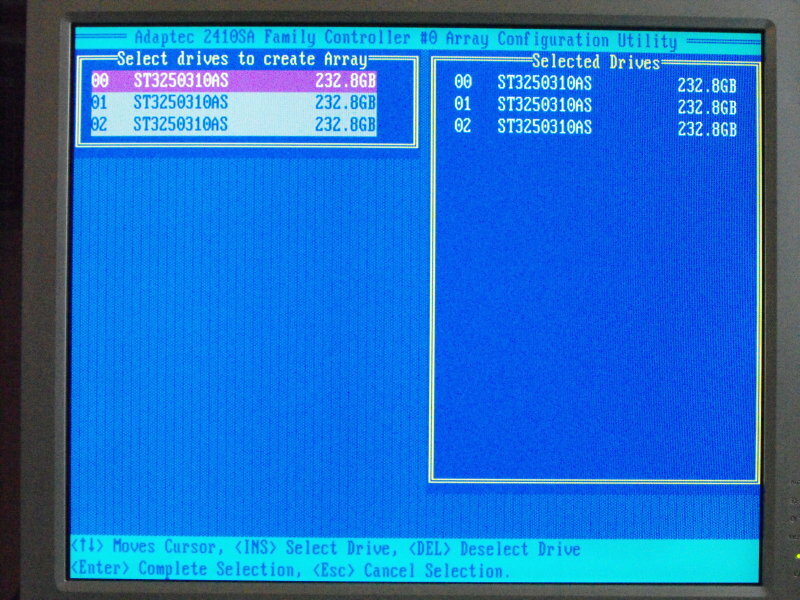 Once all three have been selected, you can hit ”’Enter”’ to Initialise the drives. At this point, you will get a Red Warning Box. 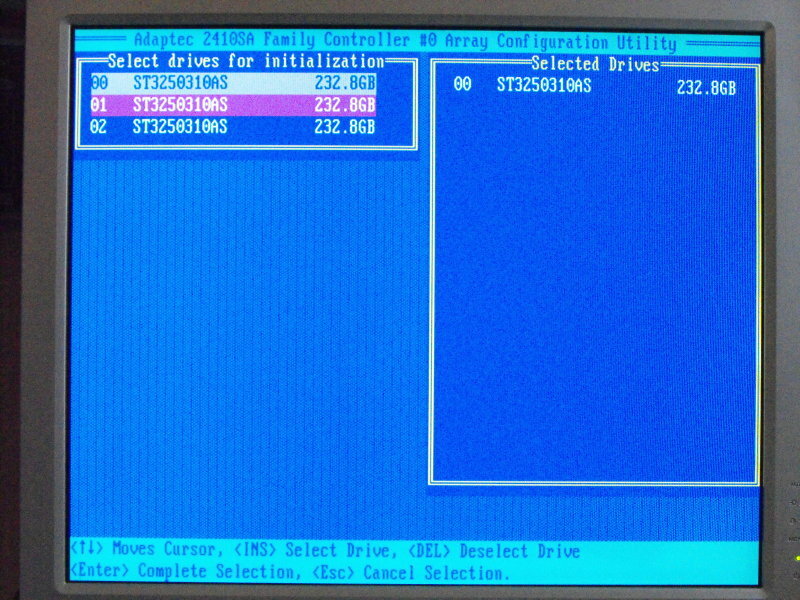 This is perfectly normal and should be accepted by selecting ”’Y”’ and then ”’Enter.”’ You cannot work with the drives until this operation is complete and keep in mind, no partitioning or formatting has yet taken place. It is solely for the controller to sort itself out. 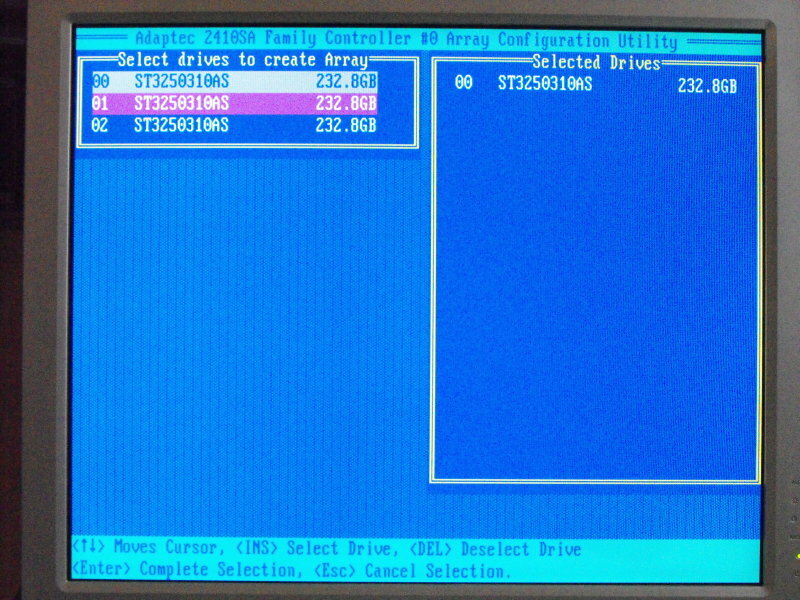 Again, you need to select each drive in turn to add it to the array. ”’Note:”’ from this point on, some screen shots have been slightly edited. This is for the security of my server and in no way should detract from the understanding of this wiki page. 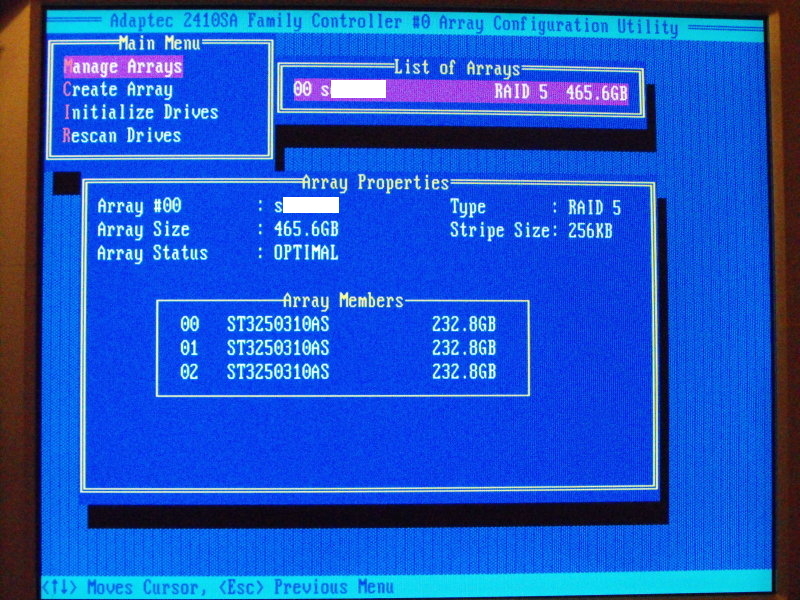 The Array Size will be automatically calculated for you, depending on your hard drive size and the amount of drives you initially added to the array. In my case it’s showing 465.659 GB. This is because hard drive manufacturers cheat and claim the hard drive size according to a convention that says there is 1000MB to a GB. However, computer scientists and therefore programmers correctly use 1024MB to a GB, hence the difference. 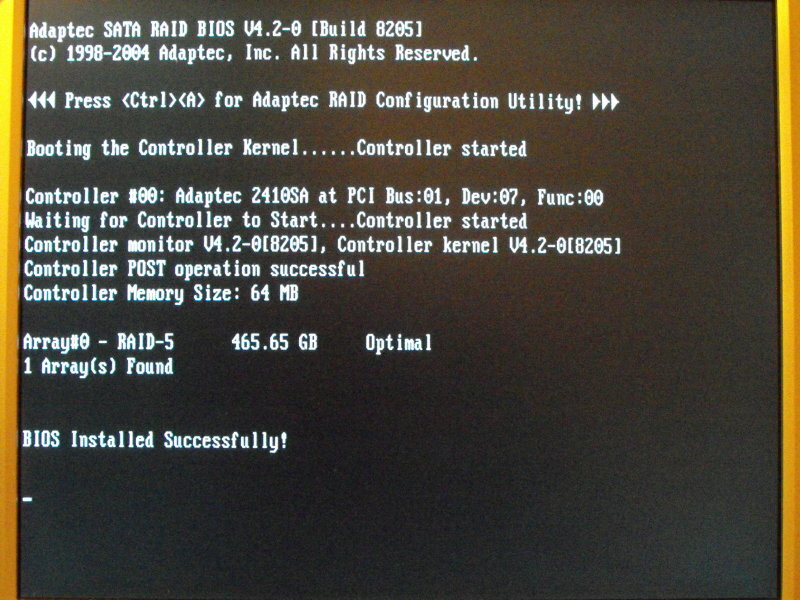 There is also some loss through the overhead that is imposed by having a RAID array. You can however choose to have the number indicated as MB, (megabytes) GB, (gigabytes) or TB, (terabytes). Note: From this point, the Adaptec manual simply says accept the defaults and as I’m far from being an expert in these matters, I took their advice. You will however come across some warning in the process. You can then choose the Stripe Size. 256KB is the default setting which I accepted. Next, is Read Caching. 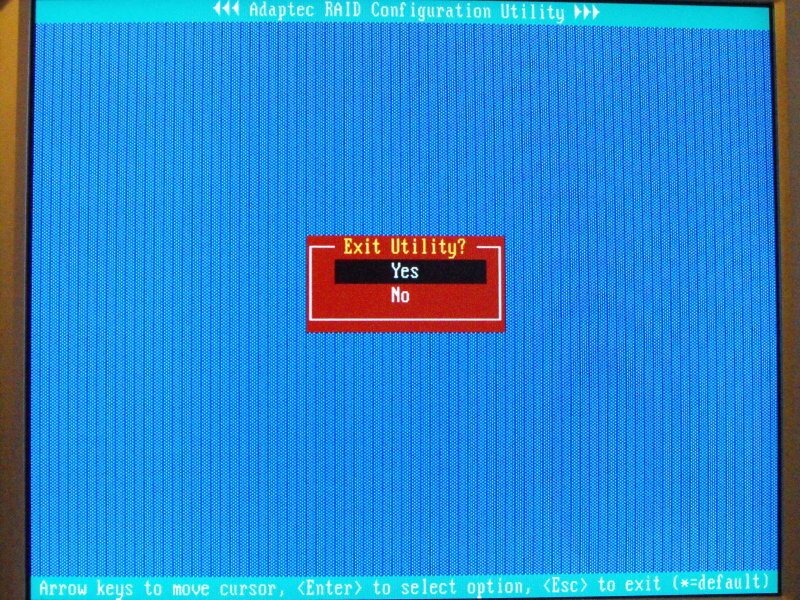 The default is Y for yes. And then, Write Caching. The default is Enable. 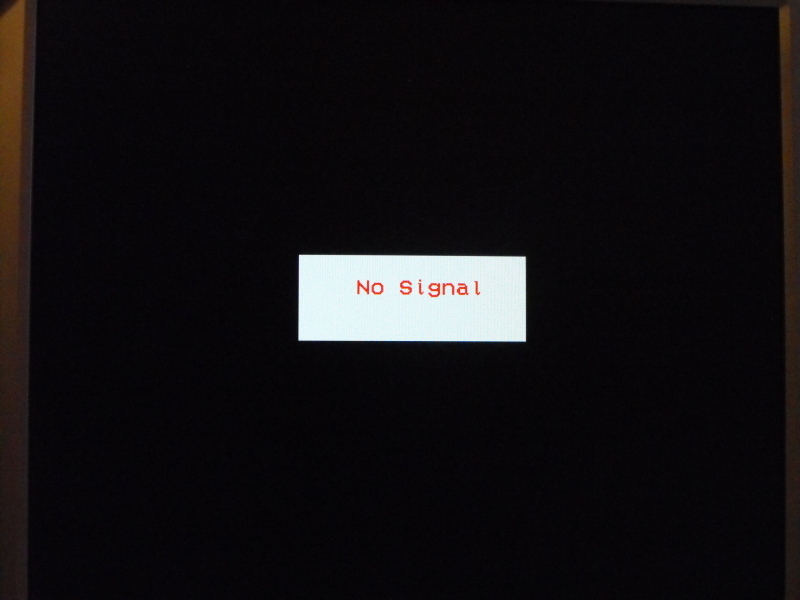 At this point a Warning Box appears telling you, it’s possible to loose data if power to the controller is lost. As for the moment, this server is being used only as a web server, I didn’t see it as being a problem. If (or when) I add it’s ability to become a file server, I may decide to turn that option off. 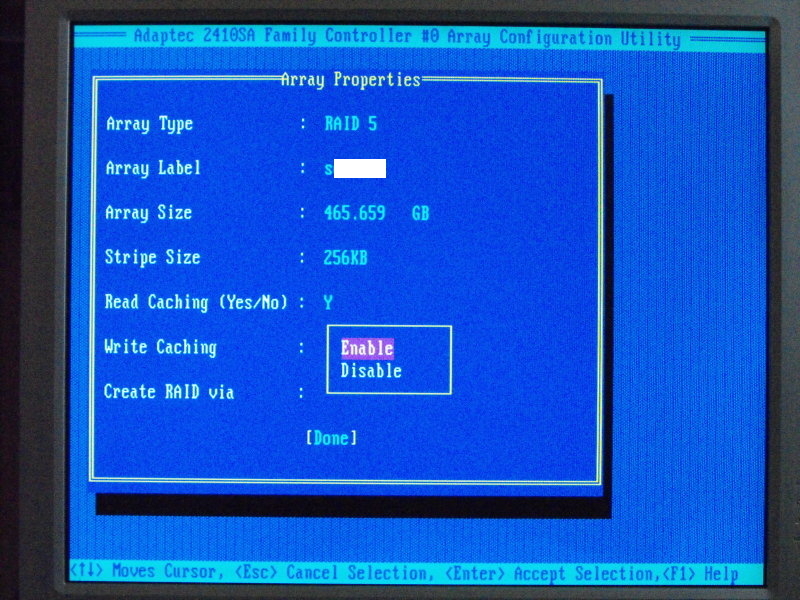 The final option before creating the RAID Array, is Create RAID via. The default option is ”’Clear”’ and that is what I used. 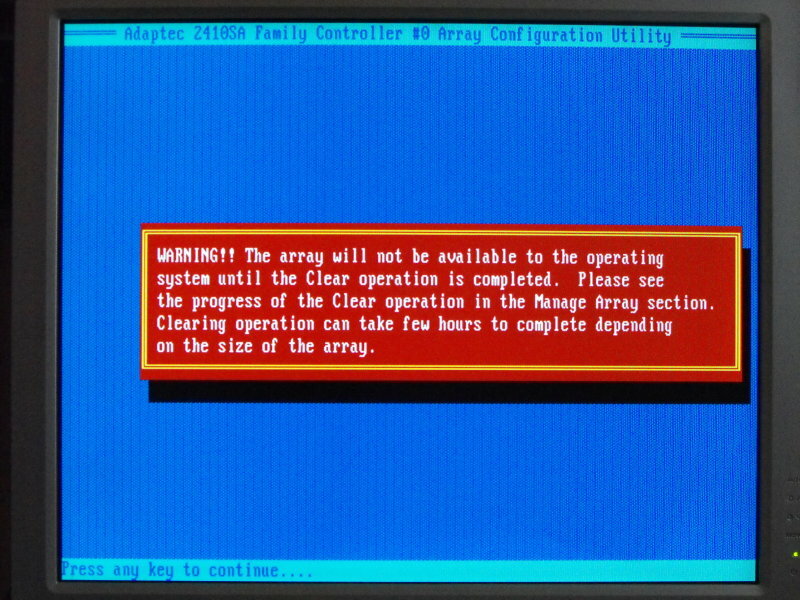 But common sense tells me, that is probably used if you want to clear a previous RAID array and start again. However, as the manual recommended using default options, I followed like a lamb and I have to say after selecting Done, it almost worked a treat. More on that in a moment. You get a further Warning, but tell it to go ahead! 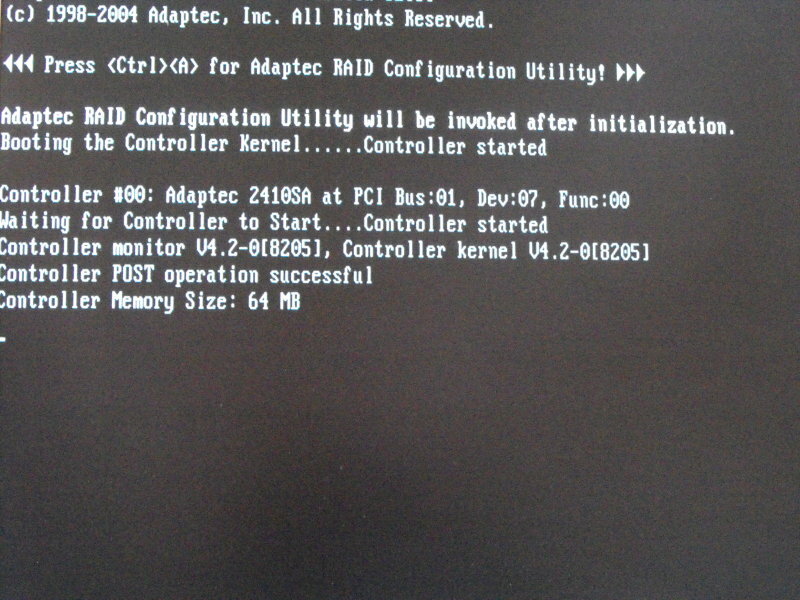 Now you are told, you can’t use the RAID Array, until the clear operation is complete. 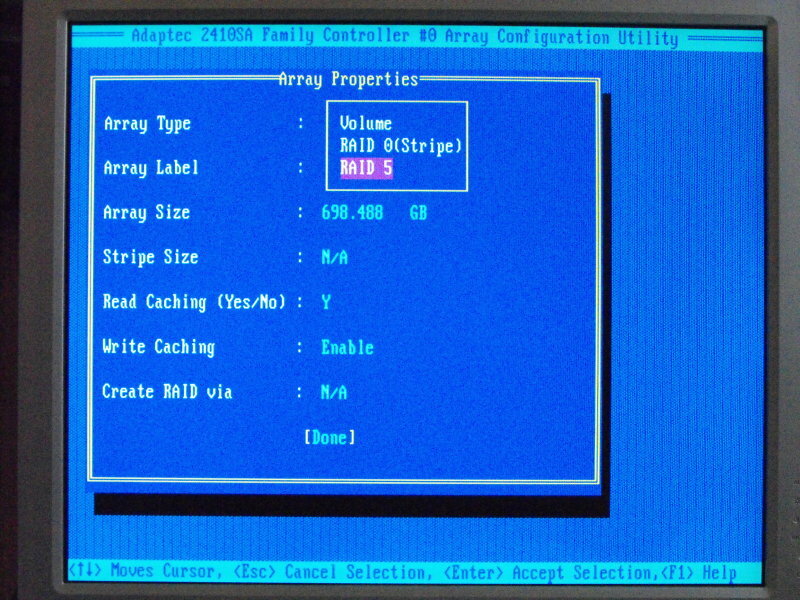 If you now go back to Manage Arrays, once the clear operation is complete, you can monitor the building of your RAID Array; a bit like watching paint dry! 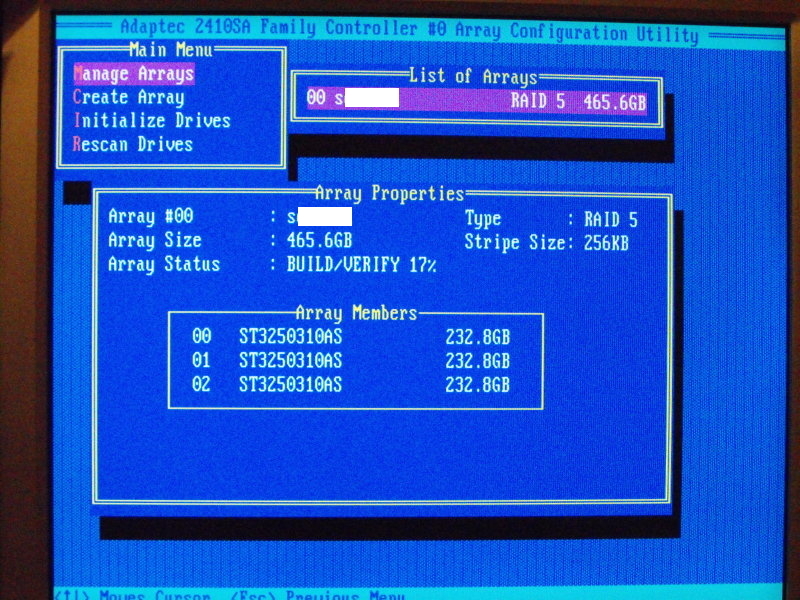 It was at this point, or more correctly at 72%, the RAID Array failed to build. What the ***, I thought! My investigations into the problem discovered drive number 01 (the second drive) was defective. All these drives were brand new, but this one decided it didn’t like living as part of a RAID set-up and refused to cooperate. Now I had some decisions to make. The one good thing about Seagate drives, is they have an excellent warranty operation. It can all be completed via the web and you simply send back the defective drive and they replace it. However, even though it’s a slick process, I didn’t want to wait that long to get the server up and running. Throughout this project, I’ve also learnt a lot (as you would expect) and I was intrigued about using a spare drive as a ”’Hot Spare”’ on the Adaptec controller, with auto failover. As soon as they were available to me, I replaced the defective drive and fitted the second into the case (making four drives in all). The building of the RAID, was exactly the same as described so far, (you still use three drives) except this time, it didn’t fail. Yes!!!! Please note, although I didn’t do it, you can in fact start to use the RAID Array pretty much as soon as it starts building, but it isn’t up to full capacity in any sense, until the building is complete. That maybe useful in a corporate environment, where an emergency is in progress, but for my home server, it wasn’t a big deal to wait until the process is finished. 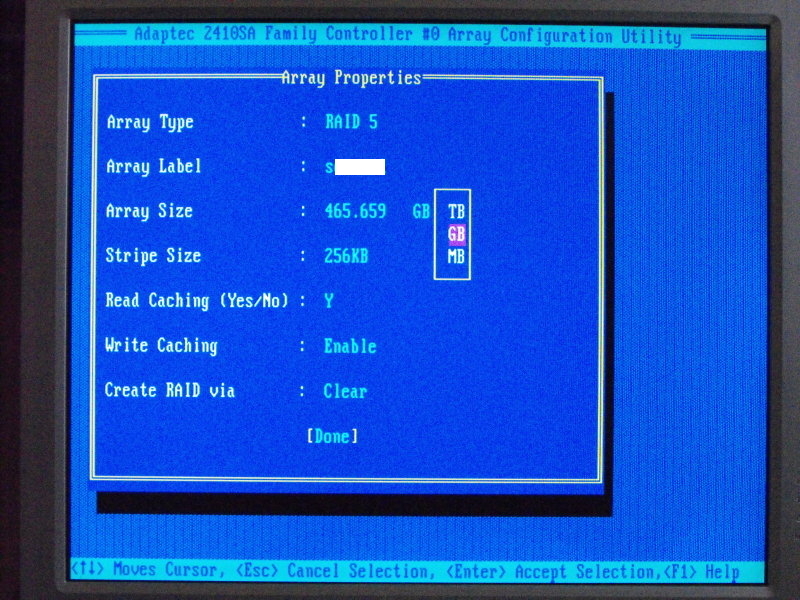 It does take a couple of hours or so though, to completely build the RAID Array. The final task, is to assign this rather intriguing hot spare. 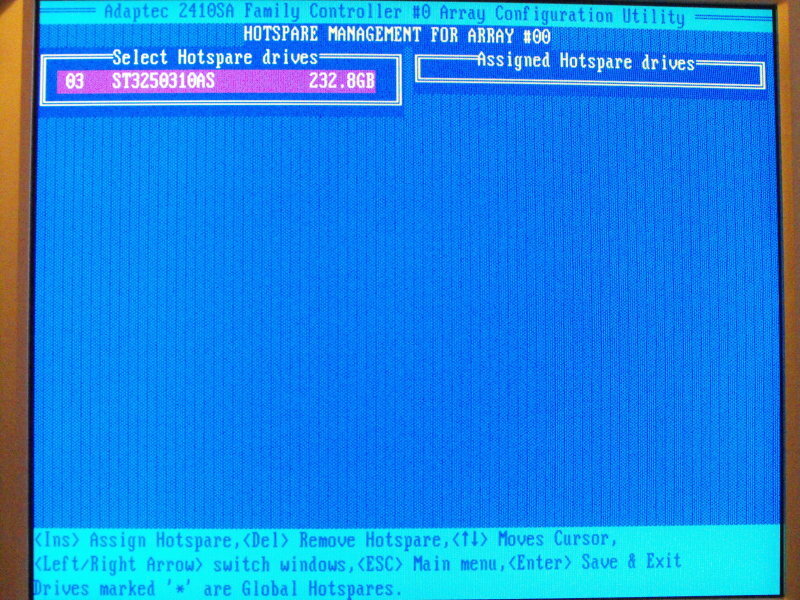 You go back into ”’Manage Arrays”’ and highlight your array, hit ”’Enter.”’ You now have the option of using the final unused drive as a ”’Hot Spare.”’ Use the keys as before to add the drive into the ”’Hot Spare box,”’ tell it you’ve finished and that’s it. 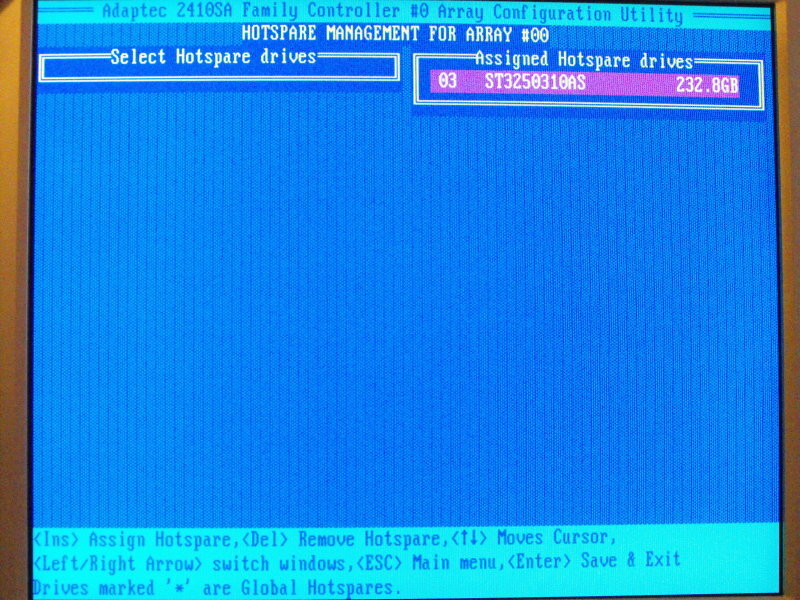 You now have a fully automated hot spare ready, should one of your drives fail. 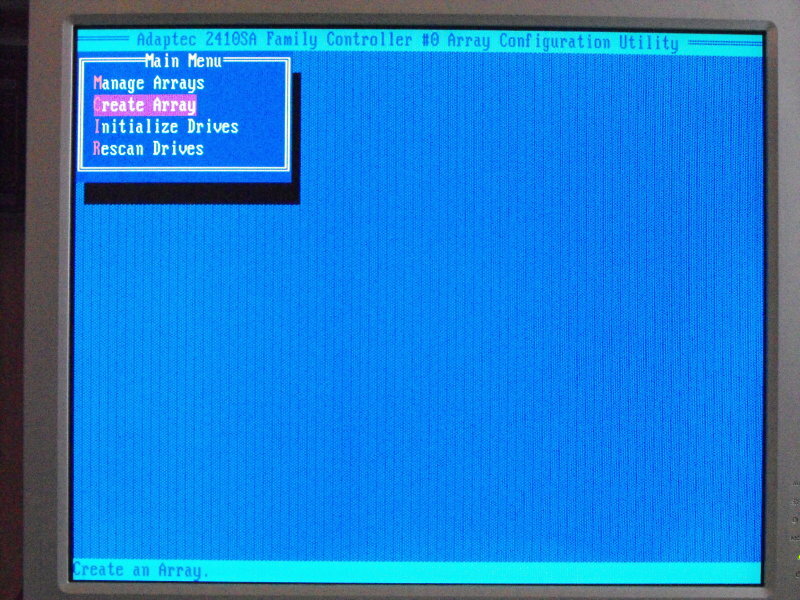 All that remains is to exit the utility and it will automatically reboot the system for you. This is where the tension rises! Don’t touch anything, but note, you have the opportunity to go back into ARC if you want to. 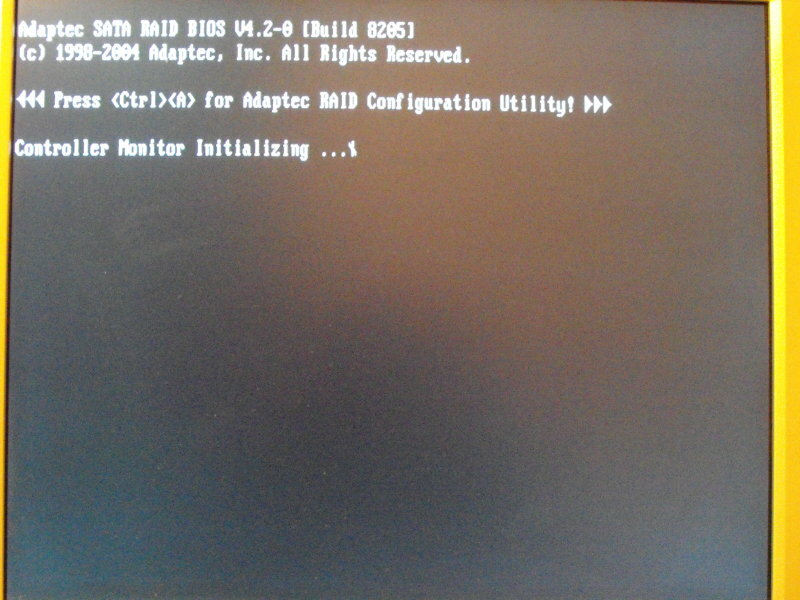 The third and final page in this series, will deal with installing the server software.